Eat your saaaalad and don't ever mention that again! PS: Fleetie says, "It doesn't get much more adorable, does it?! 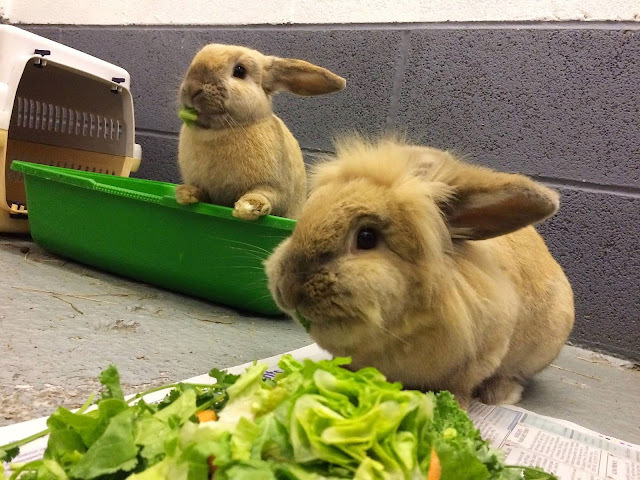 Toffee (daughter, left, with da saaaalad in da booplesnoot), and Fluffle (Mama, lionhead, foreground, nomming Da Big Saaaalad)!" Yes - let Toffee enjoy the bliss of childhood without M*nd*y for awhile longer. These two buns are so beautiful and adorable! Thank you Fleetie for the regular doses of English disapproval. You bring such lovely salads to these buns! The name mis-spelling was entirely my fault. I did a typo on my FB page when I put the picture up, and I only just noticed it now. I should have typed "Fluffle". It makes sense though, for a rabbit who likes to cause a kerfuffle. "Hoomin, there will be a kerfuffle in this pen if you don't hurry it up with that carrotini!" Hoppy and Happy 13th Birthday, Joe!